This concise text focuses squarely on the issues facing marketers in an increasingly global world. It identifies several trends, linking them together, and positioning them as marketing practices that companies implement as a way of responding to the major consequences of globalization. 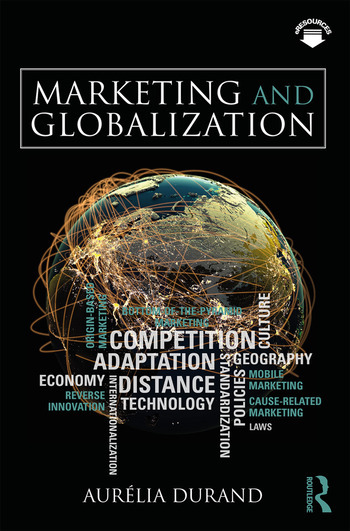 The book also includes case studies to illustrate new practices and allow students to discuss issues of market selection, entry modes, segmentation, targeting, and positioning, as well as product, price, distribution, promotion, and corporate communication policies in a globalized world. Durand’s unique approach moves beyond marketing management and strategy issues and provides students with the broader context to understand the marketing practices they’ll use in the real world. This book will prove to be an essential resource for any student of marketing and international business working to stay ahead in an increasingly competitive and global industry. Aurélia Durand is an associate professor of international business at HEC Montréal, Canada. She earned a BBA in Entrepreneurship and holds an MBA as well as a PhD in Management. She has worked in the consulting industry in her native country of France and has held academic positions in Argentina and Chile.